The first part of this tutorial will cover how to set up the cloud-hosted MongoDB database, Node server, and front end for our real-world Angular application. This tutorial series will teach you how to build a real-world MEAN stack application, covering everything from ideation and data modeling to production deployment. We'll do all of the above (including SSL and production deployment) at minimal cost to the developer. There's no reason you shouldn't be able to get your own apps launched to production at low-to-no cost! To explore the final product, check out the deployed, completed app here: https://rsvp.kmaida.net. In your own app, you'll be the administrator and will be able to create and modify events yourself (not just RSVP to existing events). "There's no reason you shouldn't get your own MEAN stack apps launched to production at low-to-no cost!" The other thing you'll likely want is an Angular Language Service extension for your editor or IDE of choice. The Angular Language Service provides Angular intellisense and autocompletion. To learn more about the Language Service, check out this summary of Day 3 of ng-conf 2017. Check your editor's extension database for "Angular Language Service" and install if found (instructions for VS Code, WebStorm, and Sublime Text are available here). This creates and installs a new Angular project with a routing module and SCSS support. Once the Angular CLI has finished creating the app and installing its dependencies, we're ready to get going on the basic customization necessary for our RSVP app. In order to change the page titles for our routes, we'll need to use Angular's Title service. This is because the <title> tag lives outside our Angular application, so we can't simply access it and add a property to change it with data binding. We'll now add some SCSS to manage global styling for our application. This will support basic layout and media queries. First, open your src/assets folder and create a new scss folder. Now find the src/styles.scss file and move it into src/assets/scss. Now our project will look for this file in the assets folder rather than in the root. Note: If you have the Angular CLI server running, you'll need to stop and restart it after making changes to the angular-cli.json configuration file. Next, let's create a few SCSS files. Bootstrap provides a CSS reset and plenty of styling. Our local _base.scss provides some basic helpers and improvements. Now we'll add a few files for variables and partials. Create a new folder in your src/assets/scss directory called partials. This file contains a $large variable with a media query for large screen sizes and an mq() mixin for easily targeting media queries in our SCSS. If necessary, we can add more variables to this file as our app grows. Now our Angular app has everything we need to get started developing features. However, before we move forward with any more client side development, let's set up MongoDB and our Node.js API! MongoDB is an open-source document database. For speed and ease, we'll use mLab's free, cloud-hosted MongoDB deployment for our application's database. We'll also set up a handy tool called MongoBooster for simple MongoDB access and management. Let's sign up and create our new database. Go to mLab and sign up for an account. Confirm your email address. Doing so will take you to your account dashboard. Under MongoDB Deployments, click the "Create new" button. Select your desired Cloud Provider and Region. 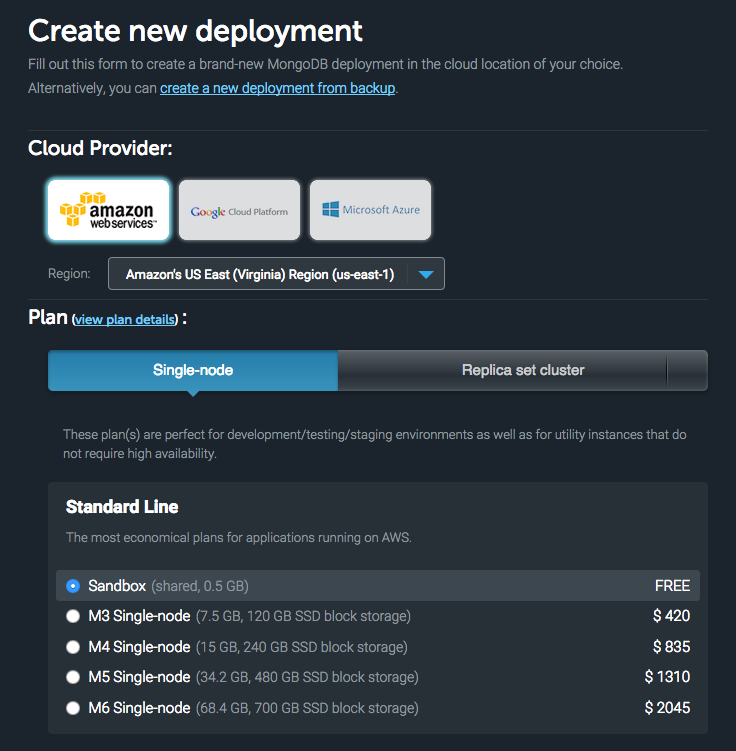 Change the Plan to Single-node and select the free "Sandbox" option. Scroll down and give your database a name, like mean. Click the "Create new MongoDB deployment" button. We now need to add a user in order to connect to our database. Click on the database to edit it. Select the Users tab and click the "Add database user" button. Enter a database username and password in the modal. These credentials will be needed to read and write to the database with Node. Make a note of the database's MongoDB URI. This should be in the format: mongodb://<dbuser>:<dbpassword>@<ds111111>.mlab.com:<port>/<dbname>. Now we're ready to use our MongoDB database. Note: If you prefer, you can host MongoDB locally. Follow these instructions to install MongoDB on your operating system. For easy database management, we can use an app called MongoBooster. The free version will serve our purposes just fine. Download MongoBooster for your OS and open it. In the upper left of the Connections prompt, click "Create" to set up a new connection. A Connection Editor dialog will appear with the Basic tab open. Enter the server address. This will be the MongoDB URI that we made note of earlier, something like: <ds111111>.mlab.com. Enter the port number in the field after the :. Enter a name for the connection, such as mLab - mean. Next, switch to the Authentication tab. For Mode, select "Basic(Username/Password)" from the dropdown. Enter your mLab database name, likely mean. Enter the user name for the user you created in mLab. Enter the password you created for the user in mLab. We should now be able to click the "Test Connection" button to confirm our configuration. If everything was entered correctly, we should receive a Test Connection dialog that confirms we were able to connect and authorize with a status of OK. Note: If you encounter a failure, double-check the information you entered. Close the test dialog and click the "Save" button. We can now select and connect to our mLab mean database with MongoBooster. Our Angular application and Node API will use the IDaaS (Identity-as-a-Service) platform Auth0 for authentication and route authorization. 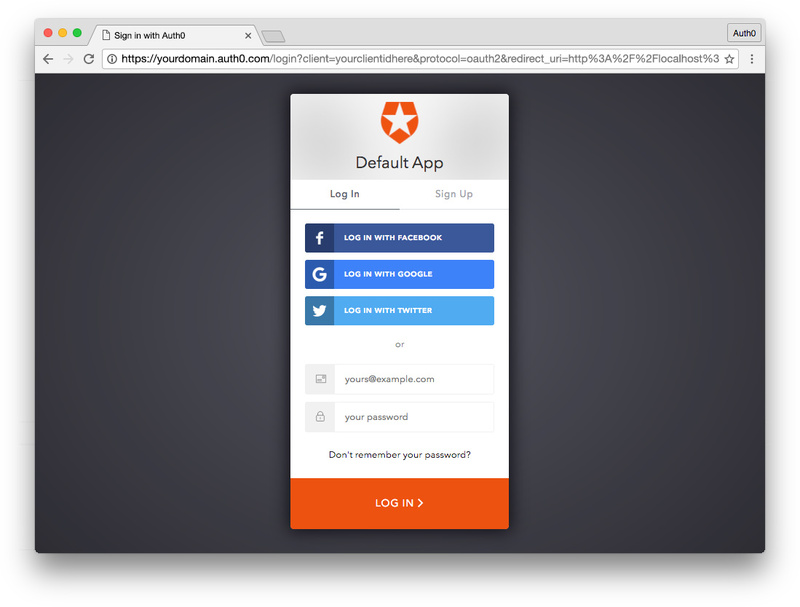 Give your new app a name (for example: RSVP MEAN App) and select "Single Page Web Applications". In the Settings for your new Auth0 application, add http://localhost:8083/callback and http://localhost:4200/callback to the Allowed Callback URLs. In Allowed Web Origins, add http://localhost:8083 and http://localhost:4200. In Allowed Logout URLs, add http://localhost:4200. Make sure the Use Auth0 instead of the IdP to do Single Sign On toggle is enabled. Scroll down to the bottom of the Settings section and click "Show Advanced Settings". Choose the OAuth tab and make sure the JsonWebToken Signature Algorithm is set to "RS256". If you'd like, you can set up some social connections. You can then enable them for your app in the Connections settings tab for your RSVP Mean App application. The example shown in the screenshot above utilizes username/password database, Facebook, Google, and Twitter. We added two ports to the callback URLs and allowed web origins because we'll be running and testing the app from both during development. Port 4200 is the port the Angular CLI serves the Angular app from. Port 8083 is the port our Node API and server uses: this will be necessary in order to test the production build. When we launch to a production URL, we can either create a new production Auth0 Application or add our production URL to the app as well. Note: If you set up social connections, enter App/Client IDs as per the instructions for each connection instead of leaving those fields blank and using Auth0 dev keys. This will be important for token renewal and deployment later. Go to APIs in your dashboard and click the "Create API" button. Enter a name for the API (for example: RSVP MEAN API). Set the Identifier to your API endpoint URL. This identifier is the audience parameter on authorization calls. In our app, this is http://localhost:8083/api/. The Signing Algorithm should be "RS256". Our next order of business is the Node server and API. Replace the Auth0 domain, API audience, and MongoDB URI with the appropriate data from your Auth0 account and mLab database. Notice that there are a few sections that are environment-dependent. For development, we want to be able to take advantage of the Angular CLI's ability to serve and watch files without requiring an entire project build each time we want to check our work. In order to facilitate this, we'll start by separating our Node.js server from our Angular front end in development. This way, we can run the Node API on localhost:8083 while the Angular app runs on localhost:4200. For production, we want the Node server to run the API and use a static path to serve the front end. Our MEAN stack should pass routing to the compiled Angular app for deployment. Using express-jwt and jwks-rsa with our Auth0 API, we can implement protection for selected API routes when necessary. We'll do this by adding a jwtCheck middleware function to routes we want to secure. We'll discuss this more later. Note: If you encounter EACCESS errors when using npm, you may need to execute some commands either with the command prompt running as administrator (Windows) or with sudo (Mac/Linux). We should now be able to access both the Angular application and the API in the browser on localhost. We can do so by running each of the following commands from the root of our project in separate terminal windows (VS Code is great at this). Note: We'll be using separate terminal windows a lot so we can keep watching the app and API while adding components with the Angular CLI. Alternatively, you could install concurrently to simultaneously run commands in the same window using an npm script. For this tutorial, we won't do this since we will need to restart ng serve periodically while generating new files, and this is more easily done if we have the CLI command running separately from our Node server. If we've done everything correctly, the Angular app will compile and show a success message in its terminal. We should also see a message in the Node server terminal confirming that the server is running and that we've successfully connected to MongoDB. Note: Eventually we'll be serving everything from the Node server, but since this requires the Angular app to be built and no longer watched, we won't do this until later. However, if you'd like to see what this looks like now, you can run ng build followed by node server. This will build and serve the app and API on http://localhost:8083. Our Node API and Angular app are now up and running in a development environment! Let's add a <title> to our home component. We'll do this by using the Title service. We already provided Title in Angular App Setup, so we can use it immediately. We'll import the Title service and then add a property called pageTitle with a value of Events. Then we'll pass the Title service to the constructor and in the ngOnInit() lifecycle method, we'll use the title.setTitle() method to change the document title to the value of our local pageTitle. By storing this title in a property, we can also use it in our component's template to set a heading. Let's do that now. The document title and heading should now show up in the browser. We have routing and a home component in place, so now we can get started on the global layout of our Angular app. Next we need to set up our Angular app's layout and global elements, such as header, navigation, and footer. We want our app to work in any size browser, so we'll implement off-canvas navigation. To do so, we need to add some markup and functionality to our root app component as well as create a header and footer. Note: For the sake of brevity in this tutorial, we're going to ignore .spec.ts files, as we won't cover testing. However, feel free to write your own tests during development. If you wish to generate components without creating test files, you can add the --no-spec flag to your g commands. This component handles interaction with the hamburger menu toggle and route changes from the navigation links. There are many ways that Angular can tackle component interaction. In this case, we want a parent to listen for a child event (App listens for an event from Header). We'll use the @Output decorator to create an EventEmitter to notify the parent component when the user has clicked on the hamburger menu toggle to open or close the nav panel. The navOpen property defaults to false (the off-canvas navigation panel is closed on load). We need access to the Router to determine when navigation has taken place, so we'll add it to the constructor. When the component initializes, we'll use the router events observable to check if navOpen is true on NavigationStart. If this is the case, we want to close the panel so it's not still open when we arrive at a new route. The toggleNav() method is executed when the user clicks the hamburger toggle button in the template. It emits a navToggled event that the parent component can then listen for and handle. When the user clicks the toggle, we'll change the value of navOpen and then emit the event with this new value. Note: Please take a look at Angular's binding syntax. Parentheses () indicate event binding and square brackets  indicate expression binding. The <nav> element contains an unordered list of our routes. For now, we only have the "Events" link (which routes to our Home component). We'll use the routerLink and routerLinkActive directives on an anchor tag to handle links to our routes. We'll specify the route we want to navigate to and the class to be applied when that route is active. We need to add [routerLinkActiveOptions] to ensure an exact match to the / path in the case of the root route. Otherwise, this link will receive the active class whenever any route containing / is active. Note: If we need access to partials (such as _layout.vars.scss) in our encapsulated component styles, we need to import those files. This file provides styles for the nav and header as well as CSS to animate the hamburger icon into an X and back. When accessing classes outside the current component, we can use the special selector :host-context(.ancestor-class) to reach out of the component's encapsulation and up the tree. Note: You could put something fancier here if you wish. We'll shift the bottom margin/padding to the host element so the paragraph margin doesn't interfere with our calculation of window height in the next step. Now we'll add the Header and Footer components to our App component, along with markup and logic to enable off-canvas navigation. We'll create a navOpen property to sync the state of the navigation panel with our Header component. This is where we'll store the event data that the Header component sends when the navToggled event is emitted. We'll use a navToggledHandler() method with an $event argument to react to this event. We'll use an observable fromEvent to subscribe to the window resize event. We can run a _resizeFn() handler that ensures that the height of the layout canvas matches the height of the browser viewport. Note: We could also achieve close to the same thing by setting height: 100vh on the layout canvas element in our CSS, but we're going with a JS option due to inconsistencies with vh in mobile browsers. We have several layouting containers to manage the off-canvas panel that slides in and out from the left side of the screen, pushing the rest of the content over. We also use the navOpen property to apply or remove .nav-open and .nav-closed classes on the <div class="layout-canvas"> element with the ngClass directive. Note: These are the classes that we used :host-context() to access in the child Header component. We'll also apply the calculated minHeight using a [style.min-height] property. Note: This is a DOM property, not an HTML attribute. It's important to note the difference. Make sure to read through Binding Syntax: HTML attribute vs. DOM property to learn about this new mental model. The <app-header> component listens for the navToggled event and then handles it with our navToggledHandler() method. We then have a container element with the router-outlet directive inside it. This is where all of our routed components will render. Finally, we have our <app-footer> component. When the navigation is open, the layout canvas should slide over. We also have a few styles for the container for routed components (layout view). Now that we have our structure and global components in place, we're ready to start developing features next time. The Angular CLI uses Codelyzer to lint Angular projects and raise warnings when the developer has used practices that do not adhere to the Angular Style Guide. Now might be a good time to run ng lint to lint our project and make sure there are no errors. "Angular CLI lints projects and raises warnings when the dev doesn't adhere to the @angular styleguide." Are you building a B2C, B2B, or B2E tool? Auth0 can help you focus on what matters the most to you, the special features of your product. Auth0 can improve your product's security with state-of-the-art features like passwordless, breached password surveillance, and multifactor authentication. We've covered setup and dependencies for the software and tools needed for our MEAN stack application. We've also established the basic layout and architecture of our Angular front end. In the next part of the Real-World Angular Series, we'll tackle authentication and authorization, feature planning, and data modeling.